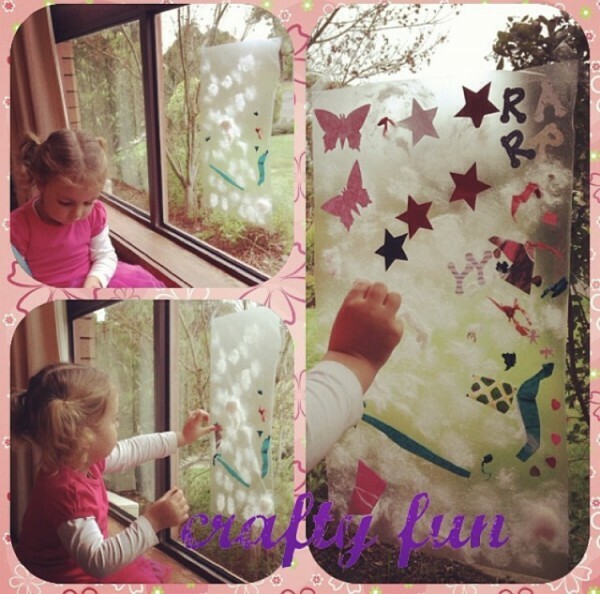 Clear contact on your window and give them scraps of material and paper to stick on it. At the end of celebrations you can get a lot of amazing craft sets. I got a lot last Christmas for as little as 10c. Keep on the look out! Like the previous Mum, I keep everything to re-use. And we just create amazing items together. making paper flowers out of napkins or recycled wrapping paper. fun and easy. Maybe get a craft kit for them. Get an old cardboard box and fill it with the cardboard rolls from toilet paper and paper towels, tissue boxes, clean/dry milk cartons; cheap crayons and pens from a $2 shop (they also have a great range of colouring book for under $5) and your child will be as happy as! We have a creation station. Which is different boxes we can pull out that has different craft items and projects. One is colouring in where we brought a crayons set (pens, pencils, crayons, textas and stamps) and colouring books on sale. Then another box is for card making where we brought the items online for a few dollars (it has cards, embellishments, stamps and punches). The next is a playdoh box which we make coloured, glittered and scented playdoh and it has all the tools in it that were given to her at birthdays and Christmas. The last is our rock decorating box that has white rocks paints, pens and pencils which we decorate and then hide in the parks for other children to find. I have made play dough at home for kids that they really loved using a recipe from this site under crafts . Home made play dough, paint . slime and bubbles are always fun.